The election on 9 May 2018 ended six decades of rule by the ruling coalition in Malaysia (Barisan Nasional or BN, formerly the Alliance). Despite this result, the BN’s longevity and resilience to competition is remarkable. This book explores the mechanisms behind the emergence, endurance, fight for survival and decline of the party’s dominance. Using a systematic analysis of key resources (budgets, posts, and seats), Washida challenges the conventional argument that a punitive threat to exclude opposition supporters from distributive benefits sustained the loyalty of the masses as well as the elites. He also calls into question whether the mere existence of party organization in and of itself enables leaders to credibly commit to power-sharing. Instead he posits a theory of mobilization agency, in which a party leader needs to design an effective incentive mechanism. In addition, he explains how the BN had manufactured legislative dominance by tactical gerrymandering and malapportionment. 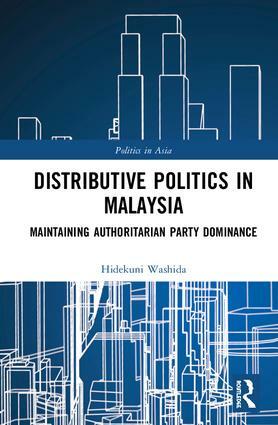 The insights drawn from the Malaysian case can help deepen our understanding of the rise and fall of authoritarian parties and distributive politics in general. Hidekuni Washida is Associate Professor of Political Science at Toyo University, Tokyo, Japan.